A short biography of E. A. Berg, anarchist sailor. Eizens Berg was born in Riga, Latvia into a fisherman's family in 1892. A skilled mechanic,he appears to have become politicised during the 1905 Revolution and became a convinced anarchist communist. He was a machinist on the battleship Sevastopol during the First World War. He was a member of the underground group of anarchist communist sailors within the Baltic Fleet and was an associate of Anatoli Zhelezniakov and Petr Markovich Skurikhin. With the outbreak of the February Revolution in 1917 he was a leading member of the revolutionary movement among the sailors. He served on the Naval Revolutionary Committee and the Tsentrobalt (Central Committee of the Baltic Fleet) which coordinated the sailors’ committees of the Baltic Fleet and later the the Naval Revolutionary Committee. He was persecuted and arrested by the Kerensky government after the July Days. He commanded a group of sailors during the storming of the Winter Palace along with Zhelezniakov. 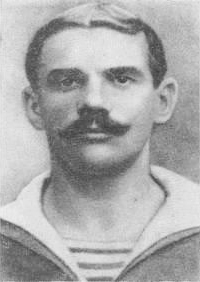 He was one of the sailors who went to the Tsentroflot –Central Executive Committee of the Navy, dominated by Socialist revolutionaries and Mensheviks which had taken a reactionary position on the July Days- on November 9th (Julian Calendar 27th October) 1917 and forced it to dissolve. Nikolai Khovrin, the Bolshevik sailor, who also took part in this action, remembers Zhelezniakov and Berg at this action in his memoirs with the latter described as having a “strong face, a powerful, almost square shape” which made “an impressive appearance. “ Berg had two revolvers tucked into his belt. Khovrin advised him to put them in his pockets to which Berg replied No! in a deep bass voice with his moustache “belligerently” bristling, adding that the Tsentroflot should be afraid of the revolutionary sailors. Khovrin describes Berg’s stentorian voice elsewhere in his memoirs, “his extremely powerful vocal chords”, which enabled him to be heard far away when he spoke to crowds. At the end of 1917 he was at the head of sailors’ Red Guard units fighting the Whites, Austro-Germans and Central Rada troops in the Ukraine. In April 1918 he was sent to the Caspian fleet where he worked hard to bring its ships up to combat capability. From July 1918 he was a member of the Military Revolutionary Committee and head of communications of the Caucasian Red Army in the Caucasus. After the fall of the Baku Commune he was arrested and executed on 20th September 1918 with 25 others by the Right Socialist Revolutionaries backed by the British. Those twenty six executed became known as the 26 Baku Commissars although not all of them were Commissars, and not all were Bolsheviks, including besides Berg, Left Socialist Revolutiaries and Dashnaks (Armenian socialist nationalists). The journalist Vadim Chaikin writing about the massacre describes one sailor shouting out “I’m not afraid, I’m dying for liberty”. As Berg was the only sailor amongst those killed, we must assume that it was he. The Soviet Government erected a large memorial to those killed in Baku. This was dismantled in 2009. It is claimed in some Soviet historical sources that Berg joined the Bolsheviks in 1917. The same dubious claim was made about Anatoli Zhelezniakov and the same scepticism should be applied to this claim about Berg.